Considering I hope to be a leader of opinion in technology education, I am glad I am directed to think about digital citizenship. Collectively, we must understand the concept of a digital citizen as a result of a change in the way we interact. We have developed an ecosystem that offers content, interaction, and access. If we take a minute and analyze the current state of this system can we say we are collectively conscious of the responsibility that comes with the privilege of being part of this? Would we be proud of how future generations feel we did about how we carry ourselves online? Will our following generations be able to “recognize inappropriate technological behavior wherever it occurs”? Digital citizenship might just be something bigger than we originally think it is. Ribble sees it as the norms of appropriate, responsible behavior with regard to technology use. I think that this issue is the perfect fit for “it takes a village”. We are living in a world connected to technology. Isn’t it nerve-wracking to ask ourselves if we are too paranoid about cybersecurity or is it time to have real conversations about the issue? What can me the dangers we could fall into if we fall short of making clear digital citizenship is of the essence? Are we doing enough professional development in this realm? I also wonder why digital citizenship wasn’t a required course instead of Turbo Pascal! I think I would have had a better chance of not learning my mistaking. Which brings me to the point about what is yet to come. 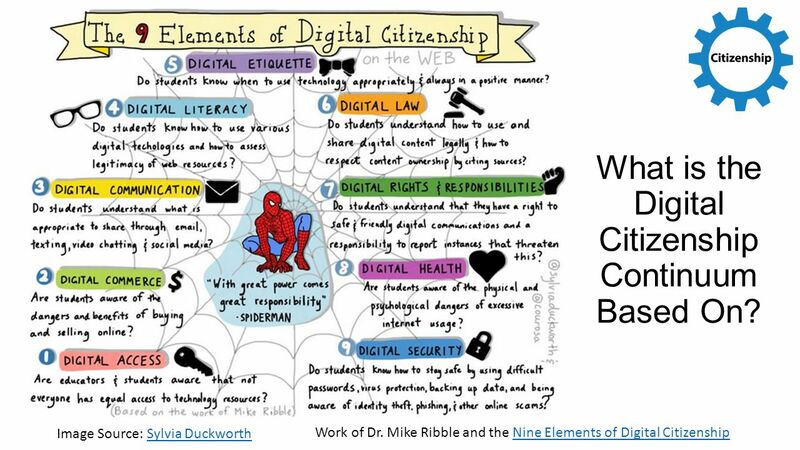 I really like the way Mike Ribble organizes the nine elements of digital citizenship and I am impressed with how his organization has a connection and the three categories are building blocks to me that creates a total citizen. I am concerned about how this concept might get lost in all the noise. How can we elevate this concept? Maybe have Kim Kardashian teach it!